The Problem: "We accept credit cards today but we do it through an online portal or with a physical card reader." Most process manufacturers and chemical distributors accept credit cards for some portion of their sales. Customers with poor or declining credit, slow payers, or small customers account for many of those charges. When these cases come up you find yourself jumping between your ERP system and an online processing portal or a physical card reader. You might not have a great way to save card numbers and associate them with the right customer profile in your ERP so you end up writing down or saving sensitive credit card information in non-secure locations. You then have the headache of having to reconcile payments between your bank, your merchant processing statements and your ERP. It can be a messy process and is ripe for errors and security issues. While most companies worry most about the processing fee they are paying, the hidden but larger costs are in the key entry errors, the time wasted reconciling between systems, and the customer service headache associated with always calling up to get credit card information. 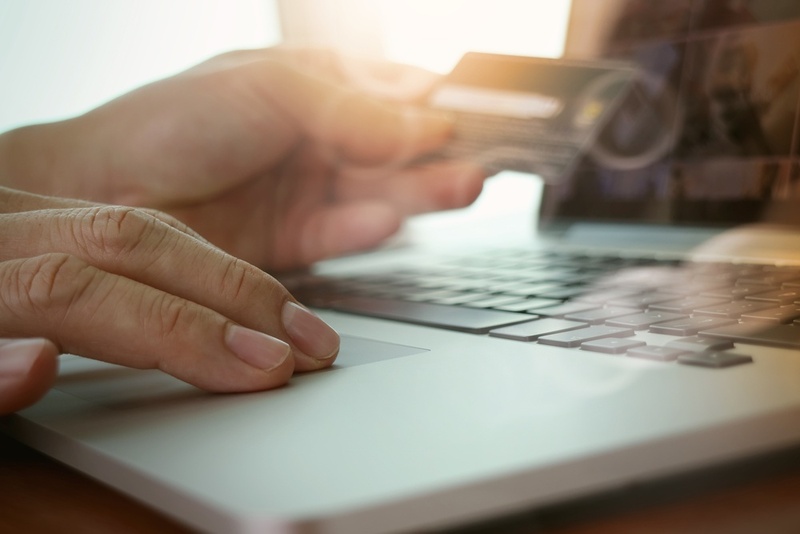 Whether you are running 1-2 credit card transactions a week or 20 a day, integrating credit card acceptance into your ERP solution can save you time, enhance customer service, reduce security risk, and speed up cash flow. Best practices are to simplify and streamline any repeatable process that involves multiple systems and double entry of data. ERP solutions today, Chempax included, have worked to integrate and automate credit card processing so that it can be done during your normal accounting and customer service processes. Best practices suggest you should integrated 100% of your credit card acceptance within your ERP system. This will allow you to save credit cards on customer profiles within your ERP in a manner that is outside of PCI scope and never stores sensitive card numbers on your servers. This is done by leveraging a patented technology called tokenization. Cards can be charged by customer service reps (CSRs) or by accounting managers at multiple points from order entry to cash application. You can associate orders or invoices with a card payment to automatically apply cash and close out associated AR items once a card is successfully charged. 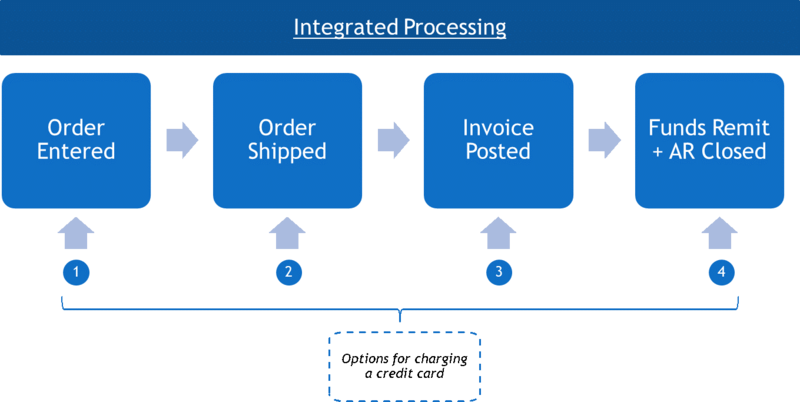 This process streamlines your payment acceptance and links it to your normal accounting and customer service interactions with your ERP. It takes the multiple steps we see in the process above and pares them down to just a few simple steps, speeding up collections, reducing the amount of time doing data entry and reconciling, and increasing the security of your payment processing and accounting. What are people saying about integrated credit card processing? Businesses are reporting time saved, improved cash flow and reduced fees when using integrated credit card acceptance. 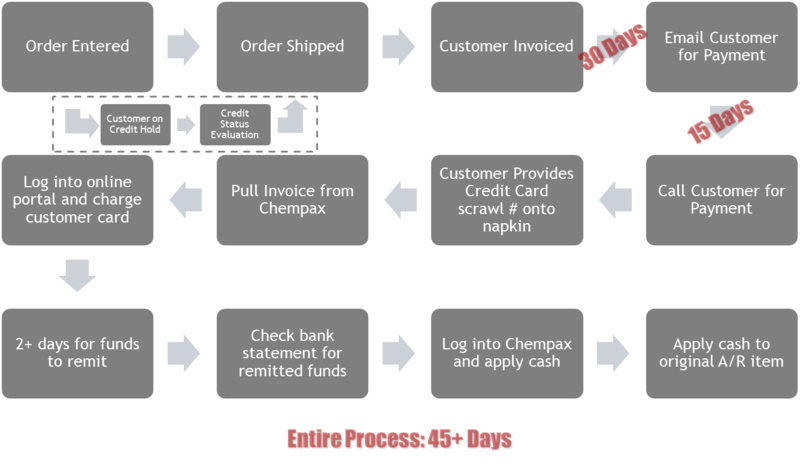 Over 50 Chempax customers are currently using integrated credit card processing and are reporting material benefits. If you are interested in integrated credit card processing in Chempax reach out to payments@datacor.com or fill out the form below.